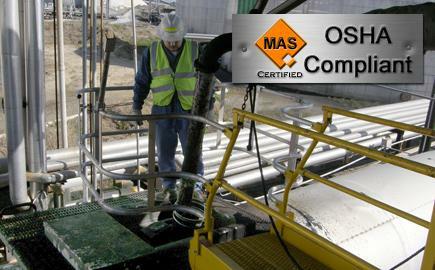 Modular Access Systems, LLC supplies safety enclosures for loading gangways, stairs and ramps. Safety enclosures for truck or hopper cars can be customized for your application and help ensure that fall protection is an integral part of the design of your loading or unloading process. 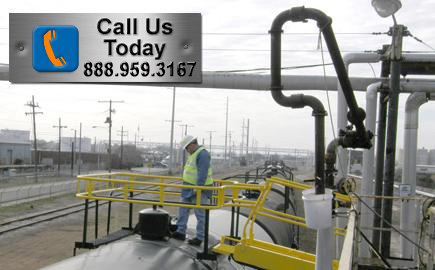 If you need full access to the top of your railcar, tanker truck, isotainer or hopper car, a full enclosure offers the flexibility and room to work that other fall protection safety enclosures cannot match. Our full enclosure has room for multiple operators and gives them the ability to access multiple hatches simultaneously. It also enables your loading rack to easily accept non-standard hatch placement in multiple truck types. Our full enclosure gives your crew peace-of-mind fall protection so they can get their job done safely and efficiently and helps you maintain an OSHA compliant workplace. A variation of our safety cage full enclosure is a full access loading platform with removable flooring which operates similarly to our full enclosure but rests above the truck or railcar and gives your loading crew access to the truck below through floor hatches. With this option, your loading crew never has to set foot on the truck below and always has a safe, level, enclosed workspace. This is our self-leveling three rail safety cage for trucks. Standard dimensions are 4' x 6' x 42". We construct our fall protection safety cages out of marine grade aluminum for weight reduction or steel for durability but custom cages are available in your choice of materials. We offer our safety cages in a variety of finishes including: safety yellow powder coating, hot-dip galvanized steel, uncoated aluminum or anodized aluminum. 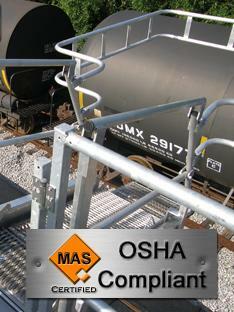 This is our two rail, self-leveling safety cage for railcars. Standard dimensions are 7' x 7' and 12" deep. We construct our fall protection safety cages out of marine grade aluminum for weight reduction or steel for durability but custom cages are available in your choice of materials. Swing gates only open in one direction which gives the benefit of a solid rail and helps prevent falls while simultaneously allowing the flexibility of access for the entirety of the length of the loading rack. 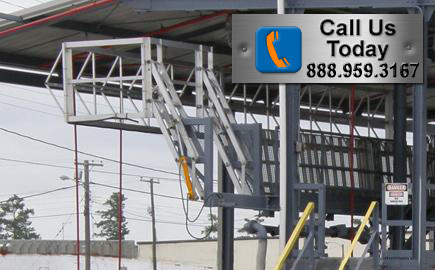 These are primarily used on tracking gangway loading racks. This is our standard extendable gangway ramp outfitted with a standard railcar safety hoop for additional fall protection. 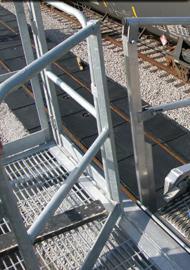 The spring-loaded foot latch which enables the user to deploy the gangway from its upright storage position is visible at the base of the gangway on the left side.